Hoot H-Series is an All-In-One treatment system, (in 500, 600, 750, 900, 1000 and 1,200 GPD sizes) is capable of both BOD5, & TSS reduction upwards of 95%. The Hoot H-Series is capable of being permitted from a 25-40% reduction over a conventional on-site treatment system. This reduced foot print allows for pools, patios, outbuildings, circular driveways and other space consuming footprints not typical of homes with septic systems. These can be either pumped or gravity drainfield systems. For More information download the Hoot H-Series Cut Sheet. Our Hoot-ANR, available in a 450, 675 and 900 GPD sizes and is currently approved and listed as an NSF 245 Nitrogen Reduction unit. The Hoot-ANR was the first tested technology to achieve below 10 mg/L, the Federal standard for Nitrogen in Drinking water. Test Center data shows a greater than 85% reduction, or 5.8 mg/L under test conditions. 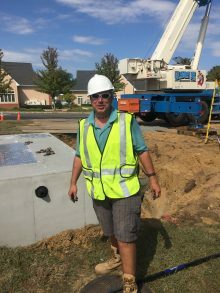 The Hoot-ANR is required for new construction and replacement systems located within the Pinelands Commission region of South Central New Jersey and can be used outside of the immediate area where advanced levels of treatment are desired for either variances or to better protect groundwater. All Hoot Systems are capable of having drip dispersal packages (although local permitting is required) as the chosen method of disposal. In addition to the size reductions of the treatment system, drip provides a more efficient use of land space, allowing the disposal field to be as close as 2 feet off of the foundation of the house, within flower beds, and as close as 5 feet of the property lines. In addition, the tubing profile is only 1/2″ in height, which provides at least a foot less of vertical mound height compared to other technologies, often allowing the drainfield to “disappear” into typical landscaping. By lowering the overall drainfield height, unsightly mounds go away and the savings in fill material alone will often pay for the cost of the drip system. Hoot Systems offers a full line of Commercial Treatment strategies that pick up where our residential models listed above leave off. These are sometimes permitted as Multiple Residential tanks tied together with common Pre-Treatment, Equalization and pump tanks, or can be larger systems, typically in 5,000 to 15,000 gallon increments. For more information on these products for non-residential applications, see or Commercial Treatment System page. The following documents are available for use to design and seek approval for systems in New Jersey. For prints for individual components, please see the Drawings tab. *Requires an additional pre-treatment tank to make a complete system.